Although its roots were the former Saks store and Gimbel's on Herald Square, this store has defined retail elegance on Fifth Avenue more than any other. Bergdorf's was always more expensive and has always had far more spectacular shop windows, as, of course, also did Tiffany's. 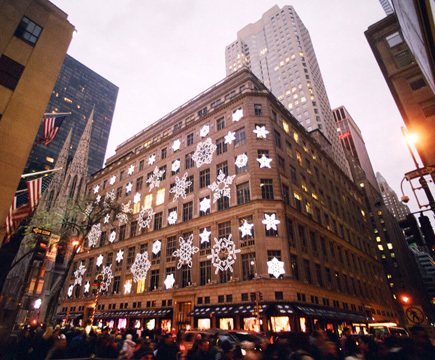 The Christmas windows at Lord & Taylor and the former B. Altman's stores lower on Fifth Avenue were also more family oriented and fun, although in 1998 Saks Fifth Avenue began to show animated Christmas windows also. Directly opposite Rockefeller Center (see The City Review article) and just to the south of St. Patrick's Roman Catholic Cathedral (see The City Review article), Saks Fifth Avenue had the location and marketing clout to best them and outlast such other famous stores on the avenue as Russeks, DePinna and Bonwit Teller. Unlike many large stores that scorned windows as wasted selling space and adopted a fortress windows, perhaps best personified by the now closed and vacant Alexander's on Lexington Avenue and 58th Street, Saks Fifth Avenue is a very handsome building, understated, but very elegant in its proportions and materials. Its tall, multi-paned windows, cutoff corners and very fine detailing are excellent. Over the years, it expanded boutiques into adjacent midblock buildings as they become available, finally undergoing a major expansion into the base of the new, adjoining Swiss Bank Tower in 1989. 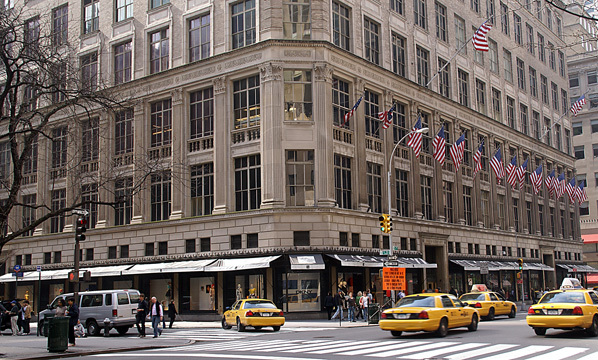 Like many of its competitors, Saks Fifth Avenue underwent a major interior redesign in the late 1980's and its was the best of the lot, employing very rich materials in a new, large central escalator bank. The new tower, which used air rights from the store, is tucked tightly behind the almost equally tall Newsweek Building on Madison Avenue. Its base is superbly handled to complement the store building. The limestone tower, shown at the right in the photograph at the left, is a delightful surprise, a clean and simple, but well sculpted shaft that is infinitely better than the back wall of the Newsweek Building and yet calm enough not to detract from the glory of St. Patrick's Cathedral across 50th Street. With what are obviously some of the greatest views in the world of Fifth Avenue, the cathedral and Rockefeller Center, it is hard to imagine why this tower was not built decades before. Saks Fifth Avenue has always been a good, attractive backdrop for vistas to the east from the sunken plaza staircase in the Channel Gardens of Rockefeller Center across Fifth Avenue and now the Swiss Bank Tower is a good, attractive backdrop for Saks Fifth Avenue and the same vistas. 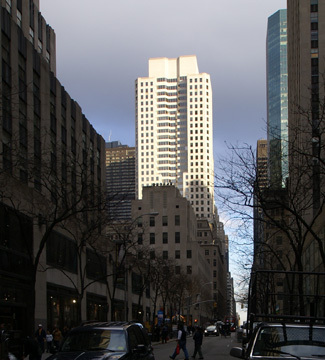 According to Robert A. M. Stern, Gregory Gilmartin and Thomas Mellins in "New York 1930, Architecture and Urbanism Between the Two World Wars," published in 1988 by Rizzoli, Saks Fifth Avenue "was the first large store building to be build on Fifth Avenue after the passage of the zoning law of 1916." Glass ball sold by Saks Fifth Avenue with model of itself crowded with other New York landmarks. Ball is sold by store and on every table in its 8th floor restaurant overlooking Fifth Avenue. "Its vaguely English Renaissance design was said to be inspired by several lesser-known eighteenth-century London buildings....By 1928, the advertising and merchandising potential of the New Modernism, already understood by many of the more sophisticated small retailers, was taken up in earnest by Adam Gimbel, who ran Saks Fifth Avenue, and set in motion a succession of renovations in his new building that would unalterably change the course of retailing. The first and most visible area of department store design innovation was the show windows....The conception of window display was first transformed by Joseph Cummings Chase, whose windows for McCreery's on Thirty-fourth Street pioneered simplified design, replacing the jumble of merchandise that previously characterized the windows with a few objects placed to create a dramatic backdrop for, say, a woman's dress or coat, and using furniture instead of the traditional ornamental fixtures to hold merchandise in place. Saks Fifth Avenue carried Chase's principle much further, employing the architect Fritz Kiesler in 1927 and the sculptor Alexander Archipenko in 1929 to design simple, striking displays." In the early 1990's, the store began to hang many American flags above its canopied shop windows, adding considerable color to the area and reinforcing the avenue's great flag heritage. In the late 1990's, Swiss Bank merged with another bank. The tower's entrance across from the south side of St. Patrick's Roman Catholic Cathedral, shown at the right, blended nicely with the store's facade. The store also added a very attractive restaurant overlooking Fifth Avenue and St. Patrick's Cathedral on its eighth floor, one of the rare locations in midtown with good midtown views open to the public.